Car Crash Test Ratings - How Are They Calculated? When it comes to car crash test ratings, there are two organizations that give the ratings: the National Highway Traffic Safety Administration and the Insurance Institute for Highway Safety. Each organization assesses the positives and negatives of the car that is being tested and issues the car a particular rating. The question is though – how are crash test ratings calculated? Car crash test ratings are calculated using frontal tests. Each organization does the frontal test differently. In the National Highway Traffic Safety Administration, or NHTSA,’s test, two crash test dummies are taken through a series of tests that include front and side impact, rollover, which is only included in the NHTSA crash test ratings, rear crash tests, which are only assessed by the Insurance Institute for Highway Safety, and Low-Speed Bumper Tests, which are also only performed by the Insurance Institute for Highway Safety. Car Crash Test Ratings are calculated by putting two dummy passengers in the front seat (frontal test) and then the car is crashed into a barrier at 35 mph. The force of the crash is then measured and ratings are assessed for the frontal test. Both organizations differ slightly in their reasoning as to the ratings generated from the test, but in the end, each diagnoses a rating to how severe the impact of the hit was to the car and to the dummy to get their car crash test ratings. For the side impact tests, the dummies are placed in the car and the two organizations simulate a collision in an intersection in order to calculate a car crash test rating. For rollover tests, the NHTSA uses the vehicle’s weight, width and the center of gravity to calculate a car crash test ratings. This is an interesting test that is done on SUVs to find the safest SUV for children and on small vehicles such as the mini cooper in the mini cooper crash test rating test. 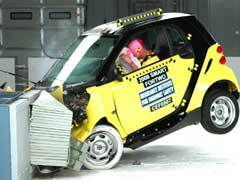 Rear crash tests are performed by the IIHS, to assess whiplash in the car crash test ratings. Low-speed bumper tests are also only administered by the IIHS to determine vehicle crash test ratings by crashing the vehicle four different times. Car crash test ratings offer a lot to you before purchase. Safety should be the first priority for any vehicle buy.